Former longtime Trump attorney Michael Cohen pleaded guilty Tuesday to eight counts — including two campaign finance violations involving payments to silence women he believed could be detrimental to the 2016 presidential campaign. 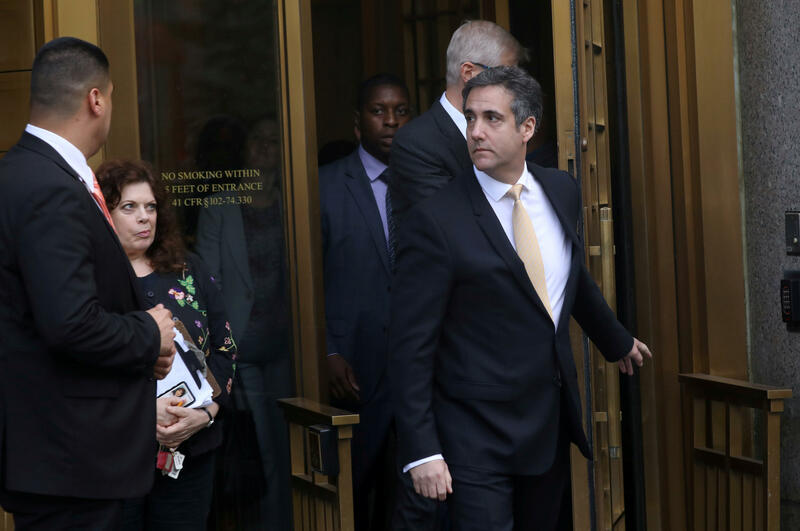 Cohen testified in federal court, according to his lawyer, that Donald Trump himself directed Cohen to commit a crime. Cohen's sentencing is scheduled for Dec. 12, with bail set at $500,0000. The government calculates he should spend between 51 and 63 months in prison. The news came the same hour that Mr. Trump's former campaign chairman, Paul Manafort, was also found guilty on eight counts related to financial fraud. Federal prosecutors claimed Cohen concealed more than $4 million from the IRS and, in 2016, made $280,000 in payments to two women who planned to speak publicly about their affairs with a "presidential candidate." Deputy U.S. attorney Robert Khuzami said in a statement outside the courthouse that Cohen sought reimbursement for the payments from the candidate's company. Khuzami called that a "sham." Khuzami declined to name the candidate — but court documents describe "Individual-1" as someone "who at that point had become the president of the United States." In all, Cohen pleaded guilty to five counts of tax evasion; one count of making false statements to a financial institution; one count of willfully causing an unlawful corporation contribution; and one count of making an excessive campaign contribution at the request of a candidate. "The essence of what this case is about is justice, and that is an equal playing field for all persons in the eyes of the law," Khuzami said in a statement following Tuesday's hearing. "And that is a lesson that Mr. Cohen learned today, and it is a very harsh one for him." Cohen's attorney said that if Cohen is guilty of violating campaign finance law, so is the president. "Michael Cohen took this step today so that his family can move on to the next chapter," Cohen attorney Lanny Davis said in a statement. "This is Michael fulfilling his promise made on July 2nd to put his family and country first and tell the truth about Donald Trump. Today he stood up and testified under oath that Donald Trump directed him to commit a crime by making payments to two women for the principal purpose of influencing an election. If those payments were a crime for Michael Cohen, then why wouldn't they be a crime for Donald Trump?" The president, in West Virginia Tuesday, declined to comment on the Cohen news, walking away from reporters. White House press secretary Sarah Sanders referred all questions about Cohen to Mr. Trump's personal attorneys. "There is no allegation of any wrongdoing against the President in the government's charges against Mr. Cohen," Trump lawyer Rudy Giuliani said in a statement. "It is clear that, as the prosecutor noted, Mr. Cohen's actions reflect a pattern of lies and dishonesty over a significant period of time." Cohen could help him during sentencing. Cohen went back and forth all morning over whether to take the deal. Stephanie Clifford, the adult film actress who alleges an affair with Mr. Trump and was paid $130,000 to keep quiet about it, said she and her attorney Michael Avenatti, "are vindicated and we look forward to the apologies from the people who claimed we were wrong." Cohen has had a front-row seat to Mr. Trump's business dealings for years. And as CBS News has previously reported, Cohen has indicated he is willing to tell special counsel Robert Mueller that Mr. Trump was aware of the 2016 Trump Tower meeting before it took place, although he has shown no evidence to support this claim. The president has lashed out against Cohen without naming him on Twitter, after news broke that Cohen had secretly recorded conversations with him. Cohen, as CBS News has previously reported, has long been under intense pressure to cooperate with federal investigators. The investigation into Cohen is separate from Mueller's investigation into Russian election meddling and any ties to Trump associates, but Mueller did refer potential evidence to the U.S. attorney's office in Manhattan.